Where’s Waldo? In Old Town Bay St. Louis, of course. 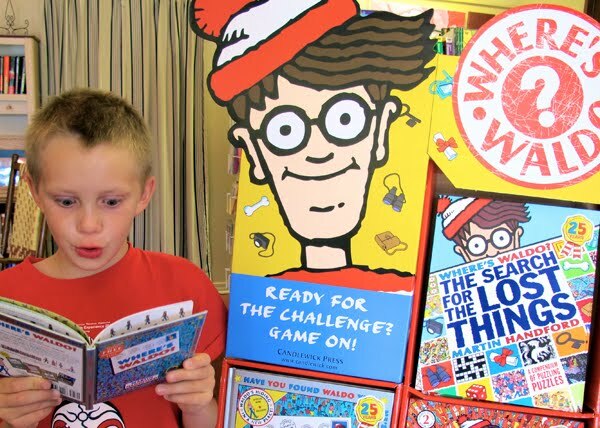 Waldo is turning twenty-five this year, and to celebrate his birthday, the famous fellow in the striped shirt and black-rimmed specs is visiting fourteen different local businesses all through the month of July. Those who spot him can win prizes, including buttons, books and more. All around town—from Bay Breeze (111 Main Street) to Fashion Express (126 Main Street) to Century Hall (112 S. Second Street) to Sloppy Dogs (203 North Second Street)—Waldo figures are showing up in public areas of local establishments. Anyone who wishes to participate can pick up a “Find Waldo in Bay St. Louis!” search list with the names of all participating businesses and collect an “I Found Waldo” card for each Waldo they spot. Collecting cards in ten or more businesses and turning them in at Bay Books will earn participants a Waldo button and an entry for prizes to be drawn at the Where’s Waldo?party on July 31. The grand prize is a complete six-volume set of Where’s Waldo? books. People who prefer a shorter version of the hunt can collect the cards from seven businesses and pick up a Waldo button at Bay Books. Waldo is the creation of Martin Handford, whose entertaining drawings of crowd scenes swept the world in 1987. Since then, the Where’s Waldo? books have held a cherished spot on bookstore shelves the world over. There are now over 55 million Waldo books in print worldwide translated into 18 languages. An entire generation has grown up searching for Waldo and his cast of wandering companions. In celebration of Waldo’s longevity and popularity, his American publisher, Candlewick Press, is teaming up with the American Booksellers Association and 250 independent bookstores all across the country, including Bay Books in Bay St. Louis, to have fun and encourage people to visit local businesses. There is no charge to participate, and the game lasts for the entire month of July. For more information about hunting for Waldo in Bay St. Louis, call Bay Books at 228-463-2688.